Last weekend's big kick-off of the Mayo League saw plenty of surprises in the top division, with Glenhest, Manulla and and Straide and Foxford United all picking up the points against what was perceived as superior opponents, while a new look Ballyheane laid down a marker of intent with an impressive 5-1 win at home over league new boys Achill Rovers. 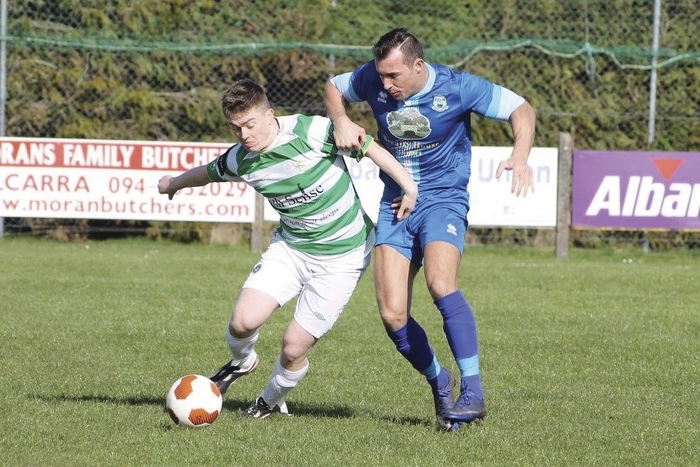 Last year's Premier Division champions, Straide and Foxford United, announced their return to the top flight in fine style, seeing off 4-2 at Green Road. Two goals from Paul Fitzpatrick along with strikes by Kevin Langdon and John Durcan sealed this coming from behind to win. The home side had gone into the lead thanks to Durkan's goal, but they were pegged back by a Darren Reilly net finder just before the break, and when JP O'Gorman put the visitors in front from the penalty spot on 53 minutes - it looked like a tough ask for the hosts. But they kept to their guns and Paul Large's side hit the net three times in the last 25 minutes to pick up the points. The meeting of Manulla and Castlebar Celtic in Carramore was the standout fixture of the weekend. Celtic was many people's favorite to make a serious push to try and knock Westport United off the top of the tree in Mayo. But it didn't go to plan for Celtic as Manualla showed their worth with a 3-1 over the Hoops. Liam Flatley put Celtic into the lead early on, but three second half goals from Anthony Elding, Enda McGahon and Chris Mauaghan sealed the points for the blues. Celtic will also be under new management from this week on, with Ciaran Kelly stepping aside from the role and Ryan Casey taking over. The Galwegian has spent the a number of years coaching in the USA and as a player was part of the Republic of Ireland UEFA European Championship winning u18 side in 1998. Ballyheane hit the ground running with a big win over Achill Rovers at home. The dismissal of Achill keeper Sean Cafferkey didn't help his side, who were already trailing, when he was shown a second yellow card, through Sean Kilcoyne's 24th minute goal. Ballyheane were three to the good ten minutes into the second half, thanks to goals from Jack Tuffy and Ashley Jensen. Kevin Lynch pulled one back for the visitors, but two Paddy Burke strikes down the home straight saw Ballyheane seal the three points. The one really big surprise result of the weekend happened in Bellek, where Glenhest Rovers saw off last year's league runners-up, Ballina Town by the odd goal in five. Rovers took the lead through a David Walsh penalty early on, before Benny Lavelle levelled it up on 37 minutes. George Heneghan's men hit the front again just before the break, through Pat Mulchrone, and 20 minutes into the second half pushed themselves further clear after Adrian Leonard found the back of the net. Lavelle did pull one goal back for the hosts four minutes from time, but they couldn't find another before the final whistle. There's only one game in the top division pencilled in to take place this weekend and that's the meeting of Glenhest Rovers and Ballyheane on Sunday at 2.30pm in Glenhest. Whichever side comes out on top in this one, will be sitting very nicely with six points from two games. The Mayo League representative side will be in action in the EA Sports Cup on Tuesday evening when they face Galway United in Eamon Deacy Park at 7.45pm.